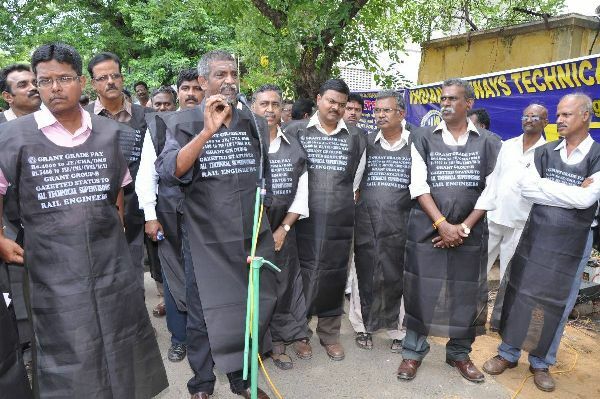 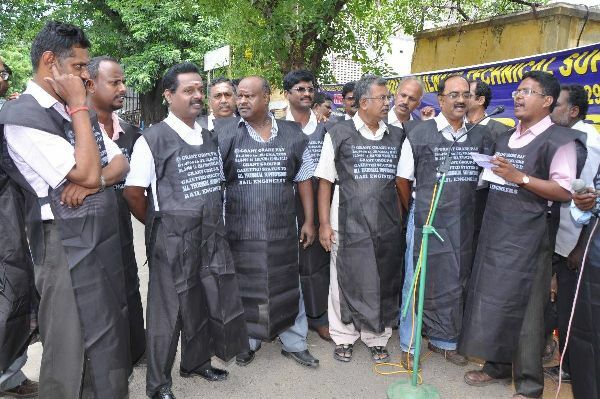 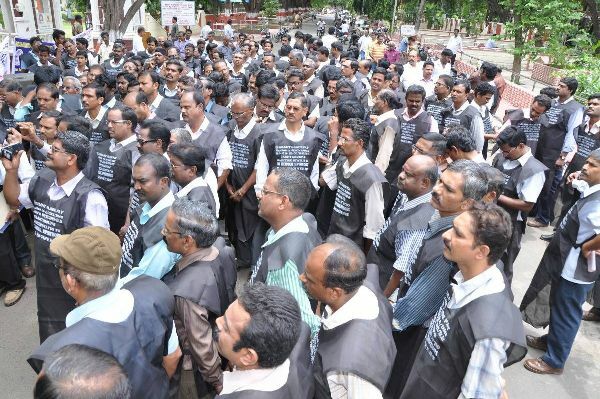 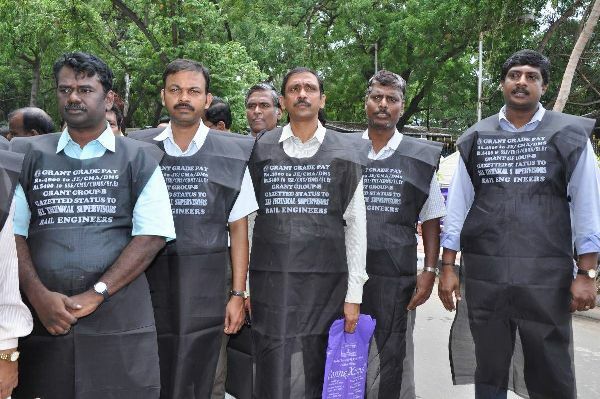 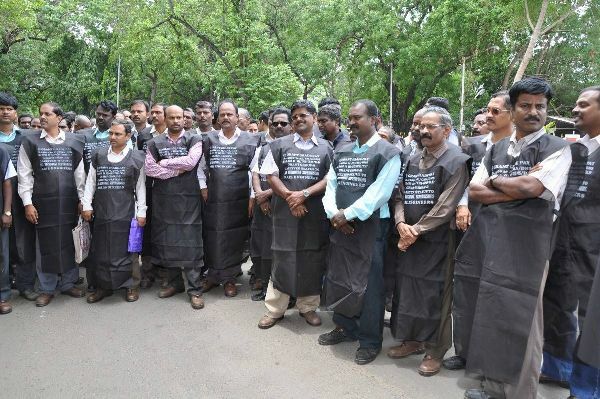 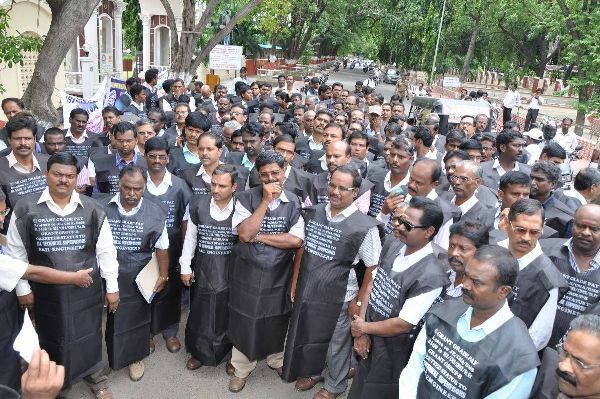 Hundreds of Technical Supervisors / Rail Engineers from ICF, Carriage & Wagon works/PER, Loco Works/Perambur, Southern Railway participated in the massive demonstration in front of GM’s office ICF, wearing black dress carrying the main demand of IRTSA. 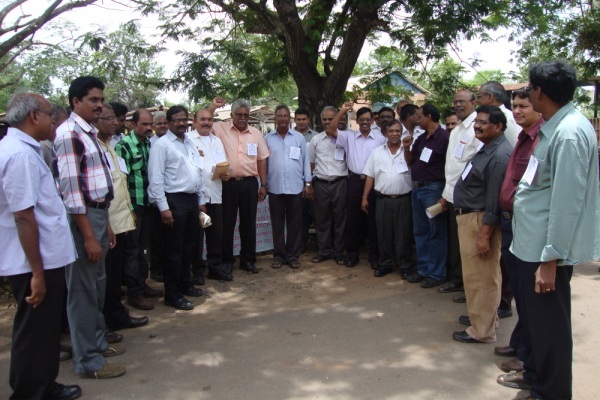 Er.K.V.Ramesh, JGS/IRTSA welcomed the spirited gathering. 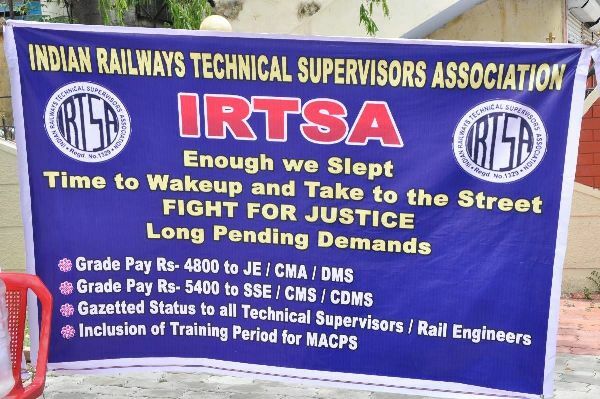 In his speech Er.M.Shanmugam, Central President, IRTSA condemned the apathetic attitude of Railways / Government towards Technical Supervisors / Rail Engineers in fixing them a decent pay. 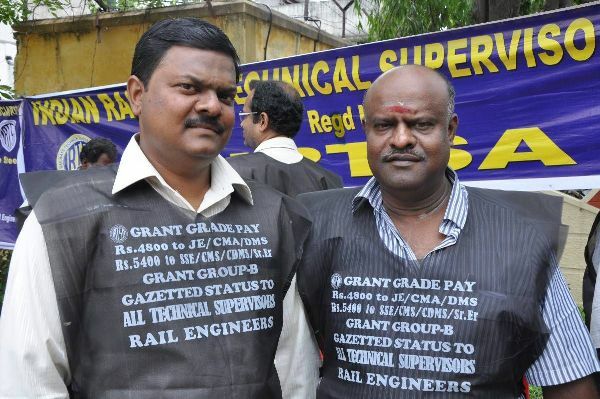 While all other Central Government departments were implemented the DOPT’s order on grant of Group-B Gazetted status to the posts carrying the Grade Pay Rs.4200 and above, Railways have not implemented the same he added. 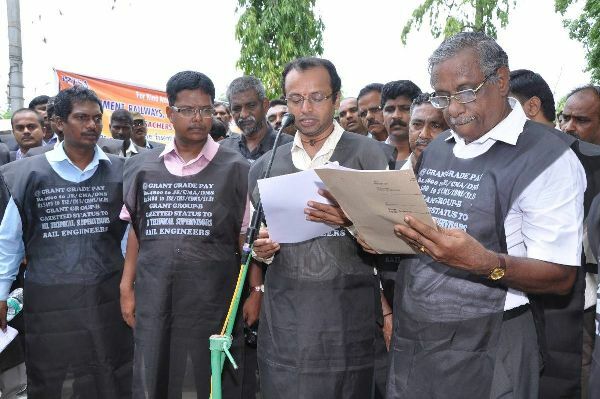 Er.Munusamy, President IRTSA/S.Rly in his sprit raising speech called upon all the Technical Supervisors / Rail Engineers to get ready for the direct action. 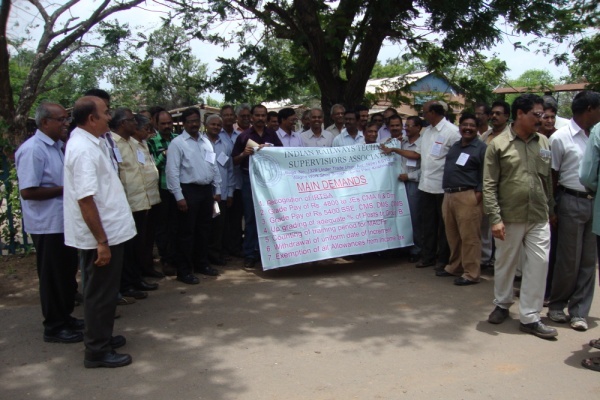 Er.V.B.narayanan, Zonal Secretary read the resolution which was passed by the gathering. 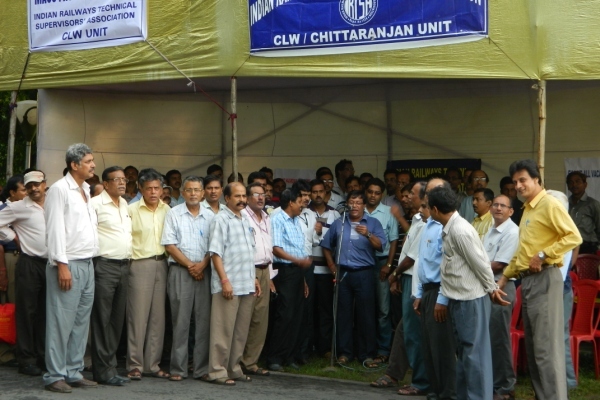 At the end of the demonstration resolution was handed over to the General Manager/ICF. 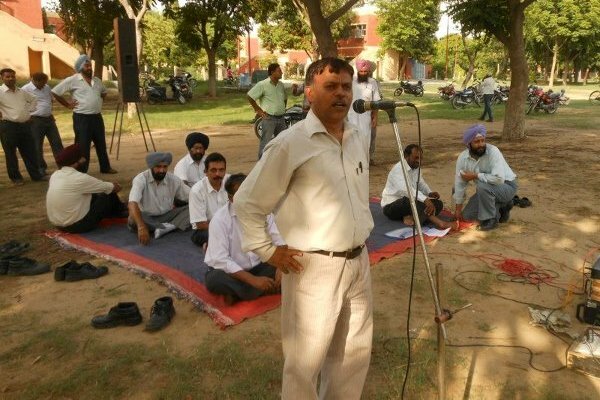 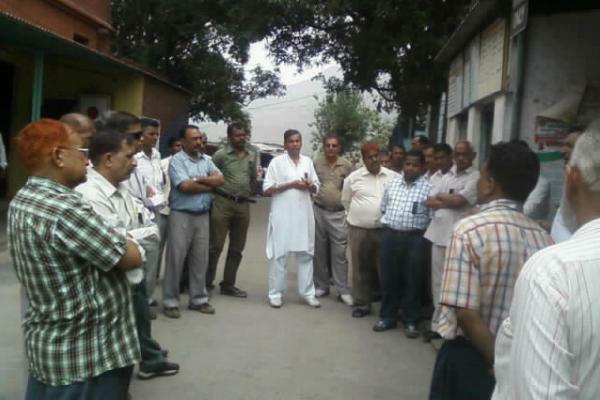 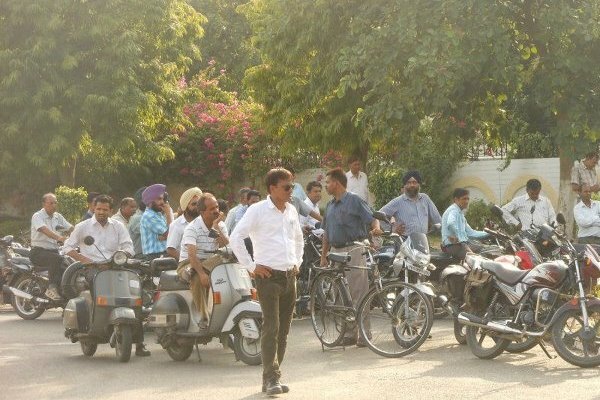 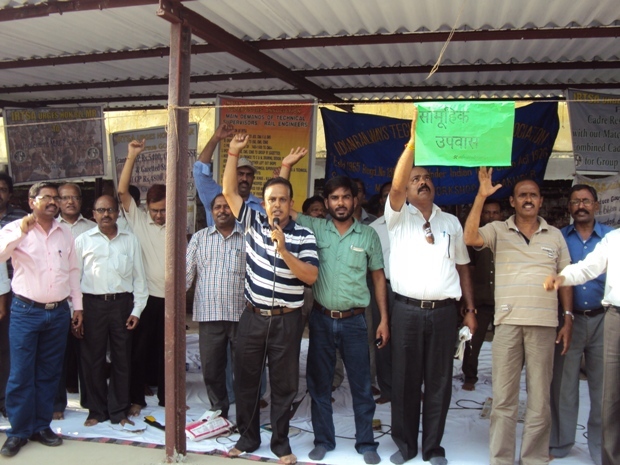 IRTSA Held A Gate Rally at Dr. Ambedkar Chowk, RCF, as per directives of Central Leadership. 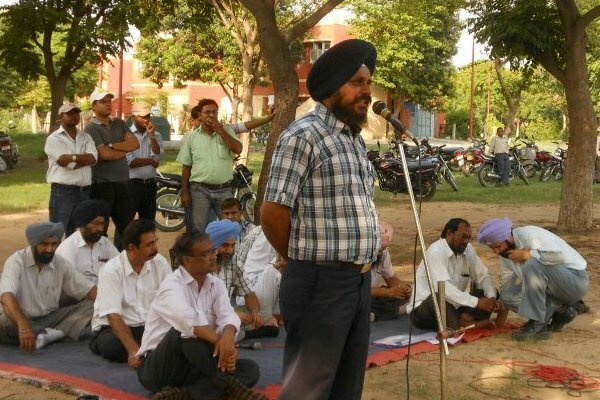 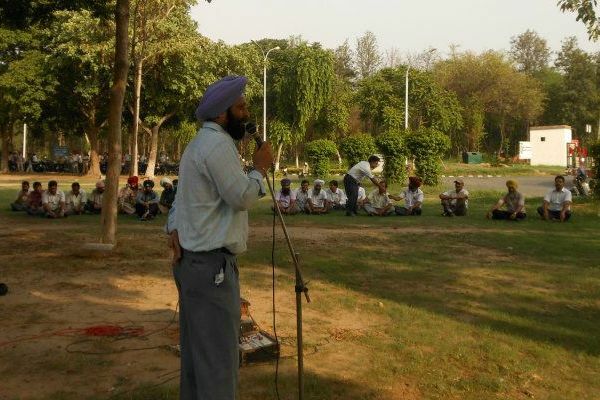 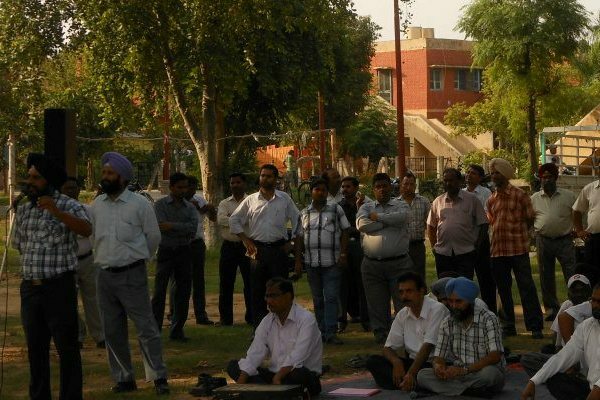 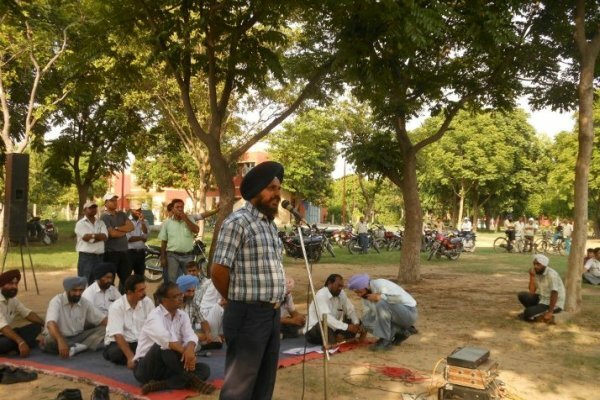 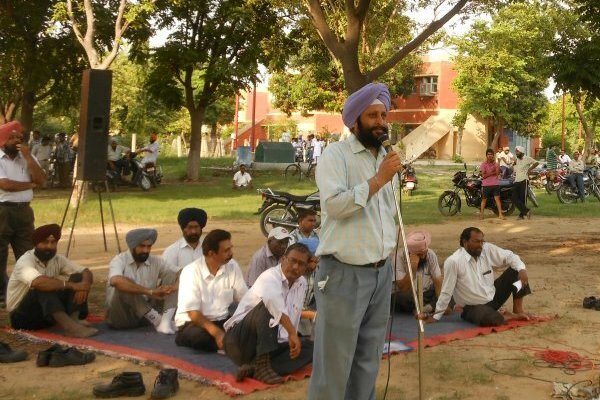 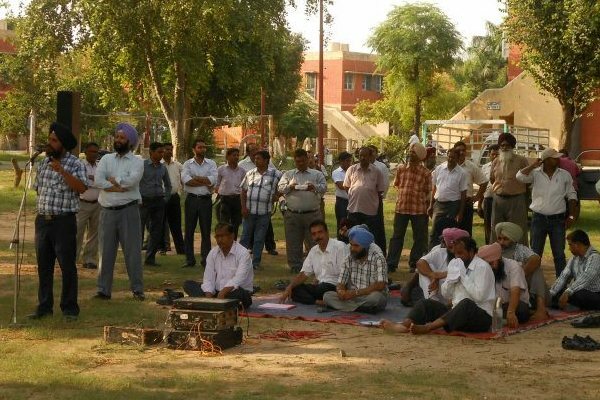 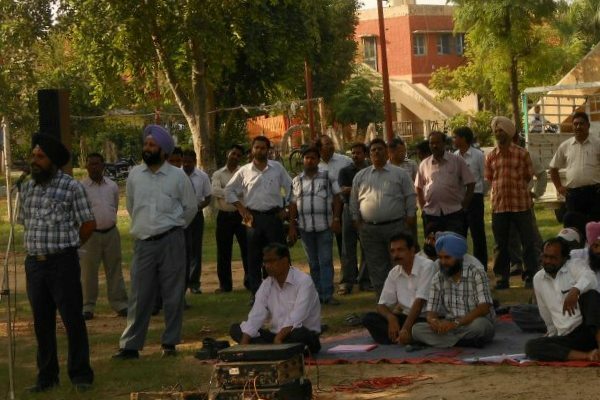 More than 3000 Engineers Participated — at Rcf Kapurthala. 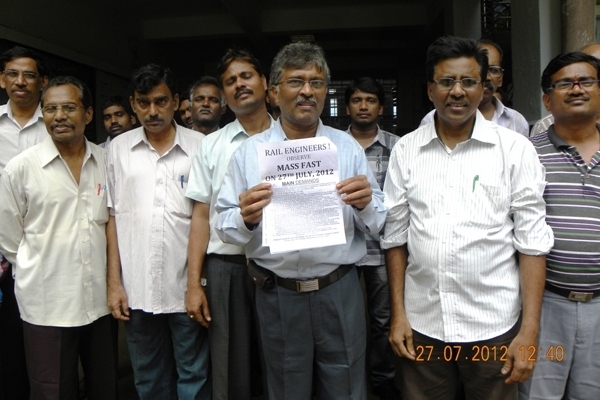 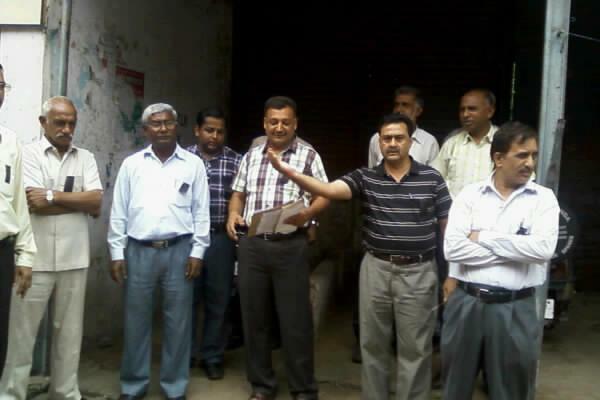 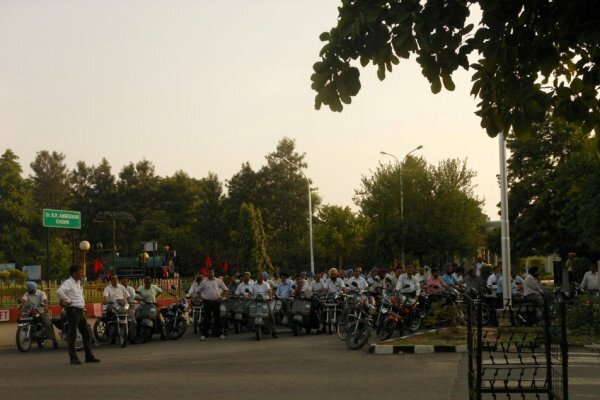 On 27/07/2012 the members of IRTSA/CLW Unit observed “MASS FAST” as per directives of CEC/IRTSA. 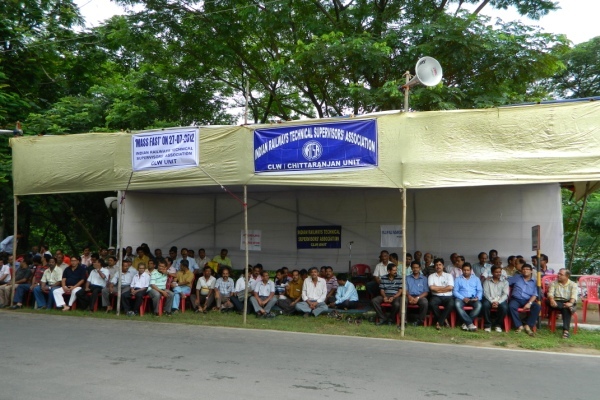 104 members sat on fast in front of General Manager’s Office from 9:00 hrs. 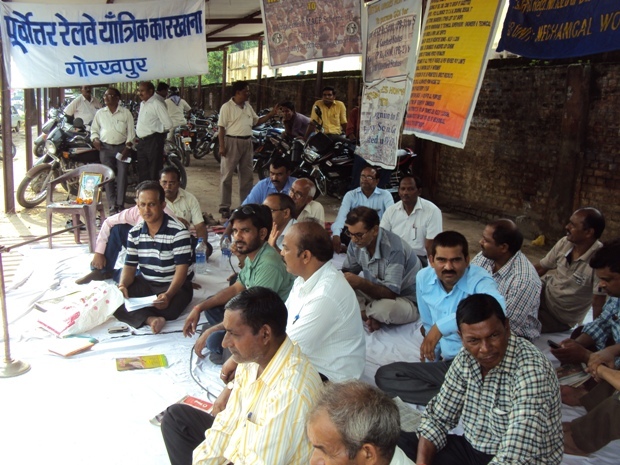 in the morning till 16:00 hrs. 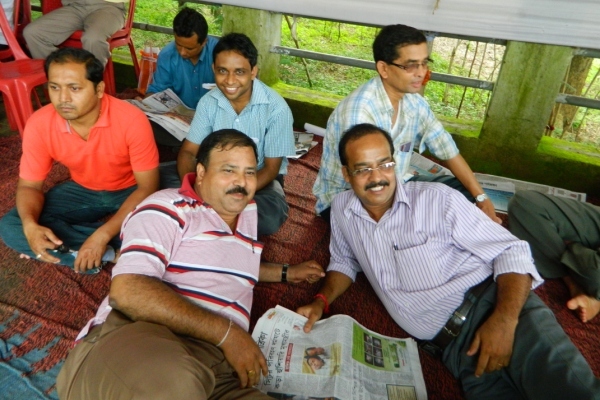 in the evening. 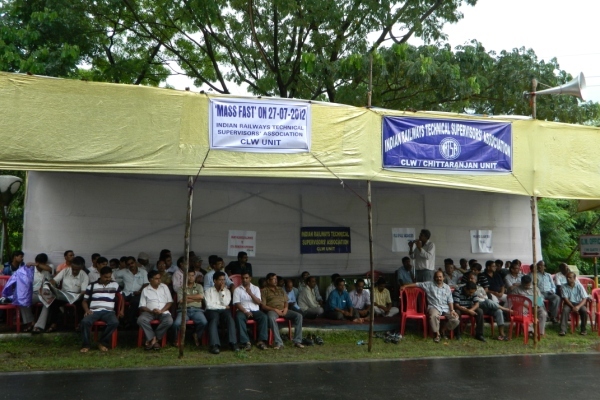 At the end of fast “Mass Demonstration” was organized in which more than 300 members participated. 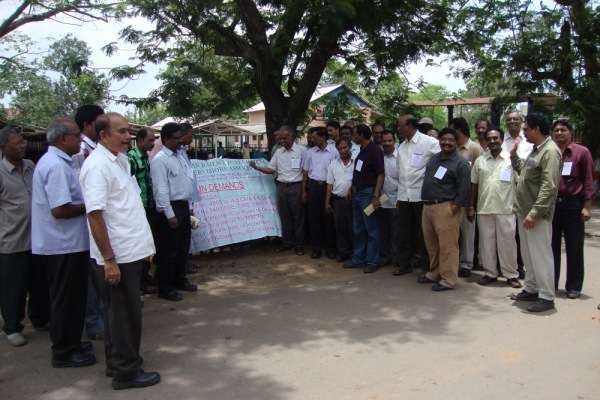 The resolution was passed unanimously which was sent to the concerned authorities through courier on 28/07/2012. 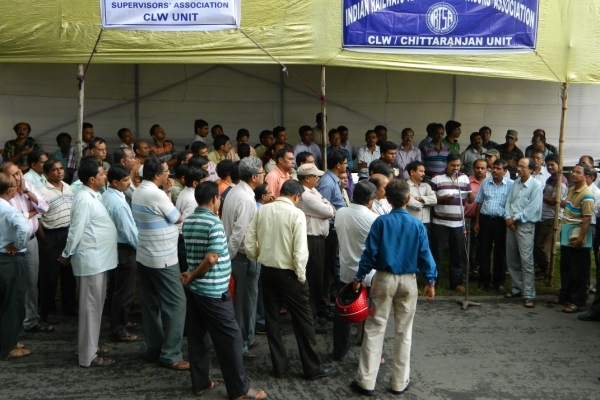 The copies addressed to the General Manager/CLW were handed over to Secretary to GM as GM/CLW was at Metro Railway/Kolkata which is also looked after by GM/CLW. 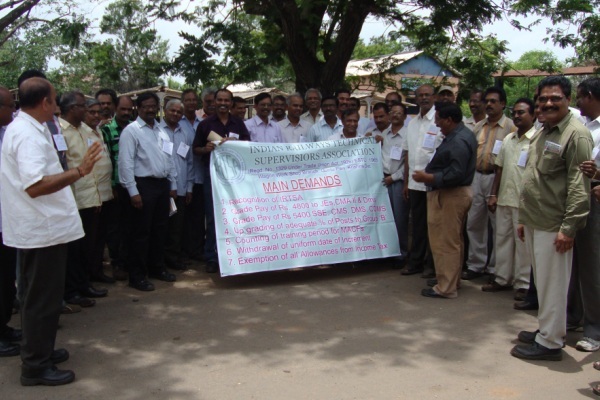 CPO/CLW accepted the resolution and assured of appropriate action after fruitful discussions. 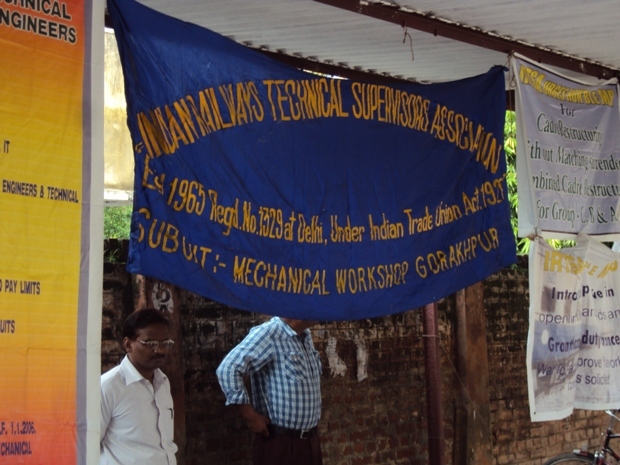 GuntaPally Wagon Work Shop Engineers Conducting Demonstration on 27.7.12 led By Er.P.Harinath, Er.D. 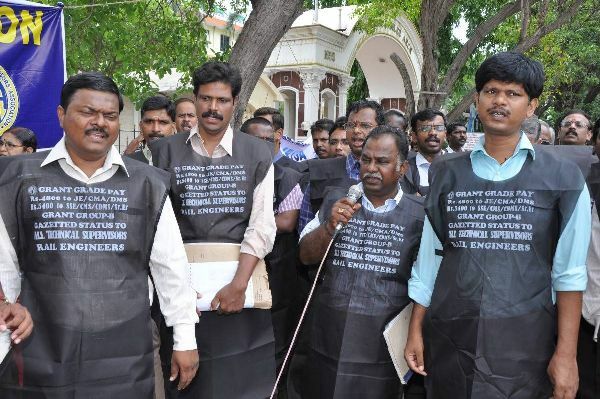 SrinivasaRao and Er. 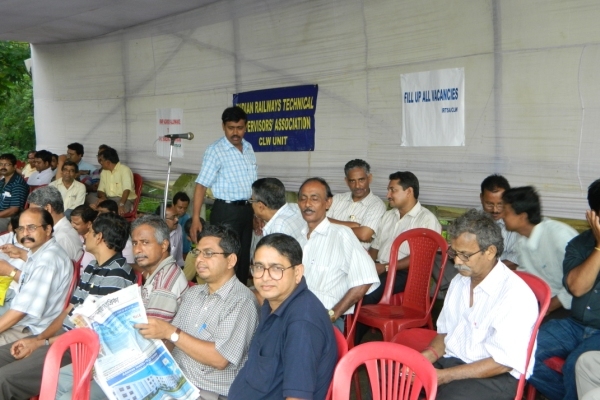 Bashkar Naidu. 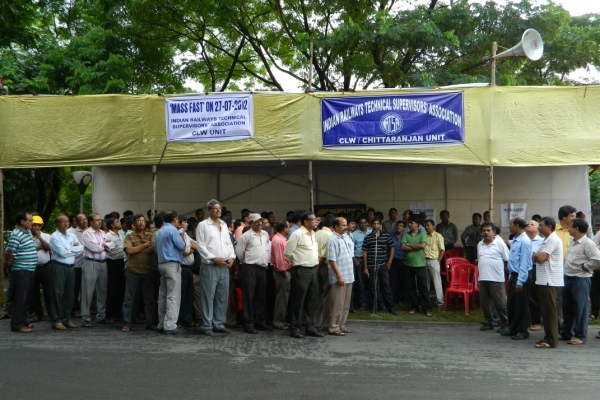 Huge demonstration was held infront of MMC, Chennai, S.Rly on 2.8.2012 between 17.00 hours and 19.15 hours condemning the casual, non-serious state of mind Southern Railway Administration on passenger safety. 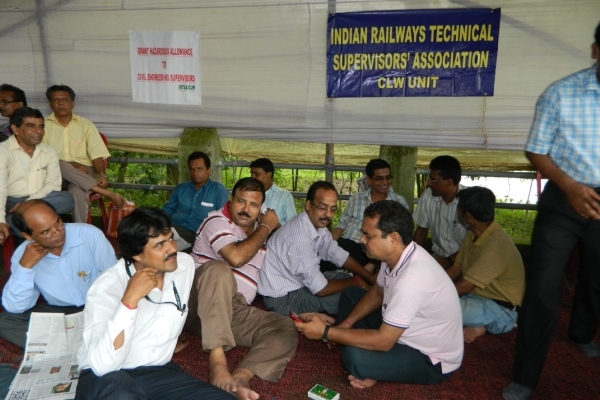 The demonstration was organized by DREU with the participation of IRTSA, Loco running staff Association, Accounts Staff Association, Station Master Association, etc. 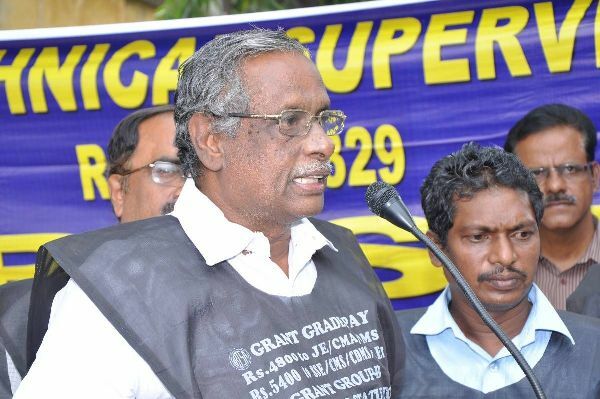 In his forceful speech M.Shanmugam, Central President/IRTSA strongly condemned the irresponsible behavior of Chennai division Mechanical Department officer and the basic Railway safety is at stake he said. 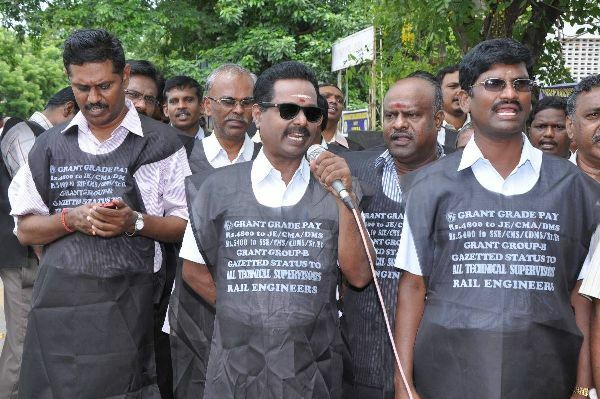 Com.Janakiraman General secretary DREU, Com.Elangovan, Working President DREU, Office bearers of Running staff, Station master Association all condemned the casual attitude of Railway Administration. 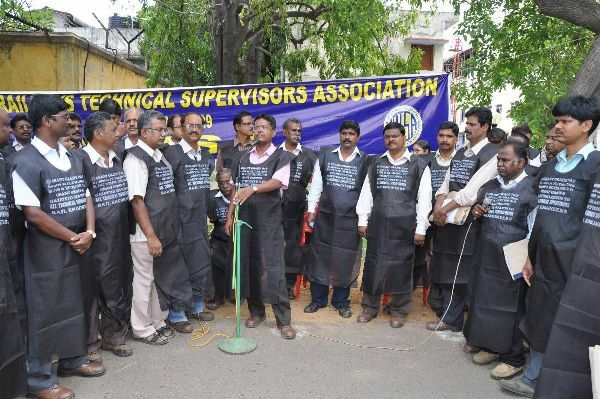 Earlier on the day BBQ sub unit of IRTSA observed the protest day. 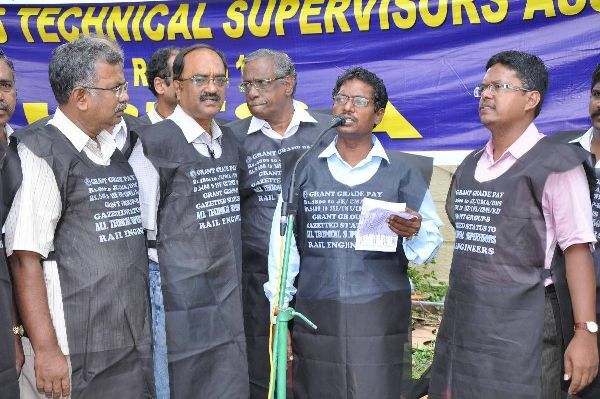 Technical Supervisors wore protest card and black badge against the threaten and pressurizing techniques used by the officials to carry out the POH extension of LHB coaches at IOH/BBQ in violation of Railway Board’s norms. 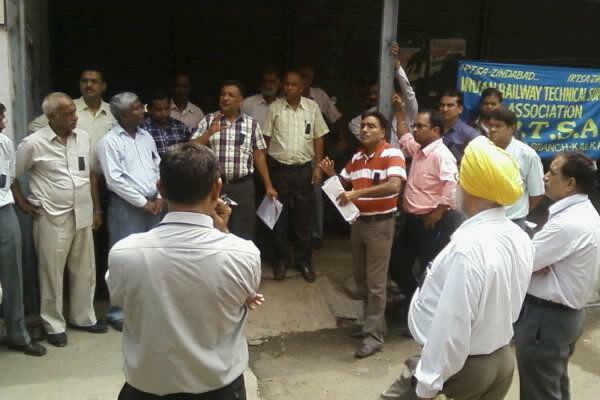 They also demanded necessary infrastructure, man power, spares, and comprehensive arrangements for cleaning of pit lines for safe running of train. 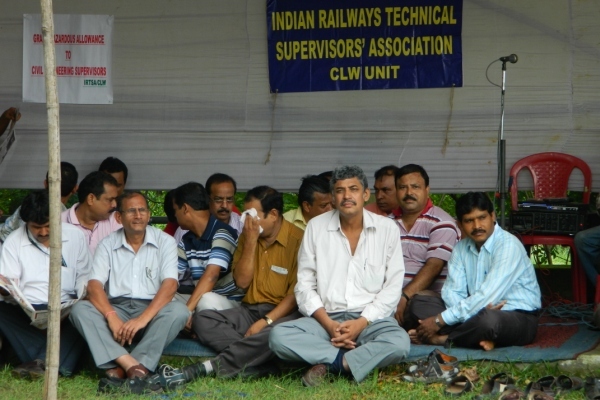 On 27.7.2012 IRTSA Mangalore sub unit organized a protest meeting between 18.00hrs and 19.00hrs at Mangalore central to protest against the unjustifiable act by the administration against Sri.K.Haris, SSE/C&W/CLT. 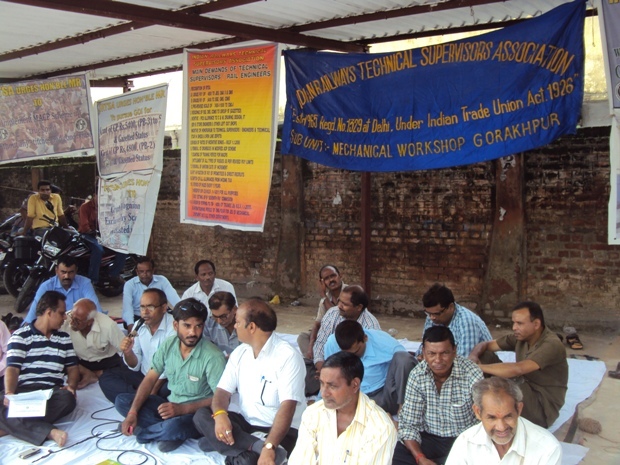 The meeting unanimously condemned the act of suspension which questions the very integrity and sincerity of the supervisors. 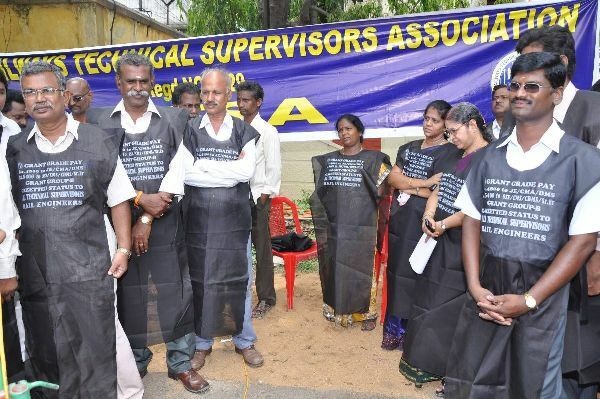 It is highly disgracing that even before the actual reason is known, a supervisor has been victimized and demoralized. 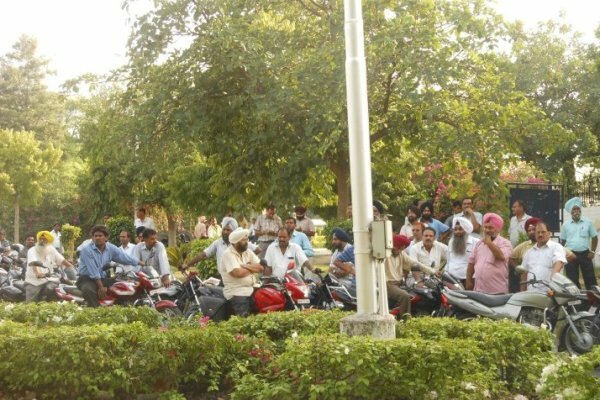 This knee jerk action by the administration implies that administration has accepted the cause of derailment to be due to mechanical defect well before a fact finding enquiry, the speakers in the meeting told. 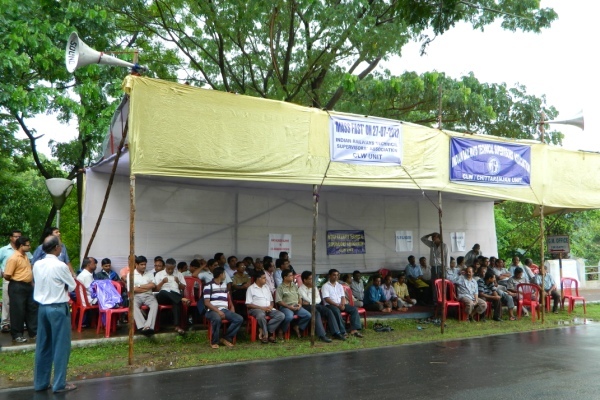 In the next day Administration has revoked the suspension of the SSE.